Kumbh Mela held at the confluence of the Ganges and Yamuna rivers, India, is the main and most auspicious day of bathing for millions of pilgrims taking a di, where the world’s biggest human gathering. 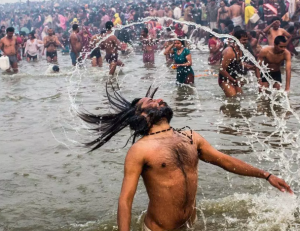 Hindus believe bathing at the Ganges will cleanse them of their sins and help them to attain “Moksha”, setting them free from the cycle of birth and death. 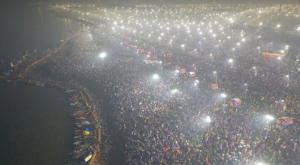 The mela meaning fair has been held in Allahabad City recently renamed as Prayagraj in the northern state of Uttar Pradesh for centuries now. Bathing began at midnight with people chanting “Hail mother Ganges”. Officially over 10 million people have already taken a dip and the number is likely to rise during the day. 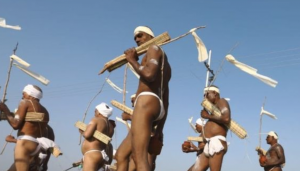 Thousands of sadhus ( saints), naked and wearing garlands around their necks, charged into the river with swords and tridents in their hands.